Keeping vegetation trimmed back from your home is an extremely important part of home Maintenance. 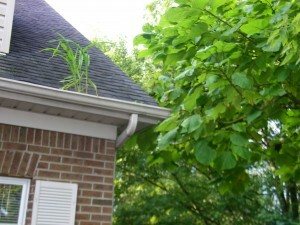 Louisville Home Inspections often reveal issues with trees and other foliage coming in contact with the structure. This often begins by creating problems with moisture. However, left unattended serious structural problems can occur. Simply leaving a gap of at least a foot or two is the key to avoiding damage to your home. It is also important to make sure that your air conditioning unit has at least two feet of space between it and any vegetation. This will allow the unit to “breath” properly and avoid restricted air-flow that can contribute to premature failure. This might be a good time to mention that your should avoid throwing your clippings in the direction of your air condition coil when mowing and weed eating. The clippings can get trapped in the coil damage your unit. Always direct your clippings away from your air conditioning unit. Isn’t it amazing how quickly vegetation can get out of hand. 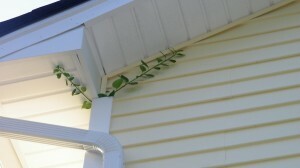 Even the slightest opening can provide an opportunity for vegetation to sneak up on your home. This Louisville Home Inspector took this picture recently. The branch is from a small bush but it has traveled two stories high and is sticking out from the top of this corner channel. Next stop, the ATTIC! Trimming your hedges and landscaping is not just for aesthetics–it will help you protect and maintain the home that you love. You have to fight back the jungle for the sake of your home. Love it or hate it, using Craigslist to generate leads tends to bring out strong reactions from those Real Estate Agents who have used it. Many agents who do use it end up feeling like it is a waste of time — bringing them no sales and crummy leads. I can tell you that it’s not a waste of time at all. In fact it is responsible for 3-5 sales a month for me, and has put over $236,000.00 in my pocket …for free! So not only does it work …it works predictably and consistently when done correctly. One of the biggest mistakes you can make in crafting and creating your Craigslist ads is to model them after the other ads you see on there. Look at what everyone else is doing – and DO NOT do the same. Do something different and bold. Every time I hear someone tell me, “But Vince, no one else in my marketplace does Craigslist ads this way,” my response is “COOL!” That is the exact reason you want to do them differently …it is the way you will become an industry leader. So, for example, when you see all of the headlines on most real estate Craigslist ads looking the same, and giving the same boring information, RUN. You want your headlines to be bold. Don’t be afraid to say things like “once in a lifetime” and other dramatic type language. Only headlines that move your audience will get them to click — which is the objective of placing all these Craigslist ads. Plus, you want your ads to stand out from all the others, not blend in with them. So start getting creative and make your headlines pop! Another mistake that many real estate agents make is to try to include every selling feature of their listings in their Craigslist ads. This is not only not necessary, but not advisable. I started leading up to this in the last section, but one of the quickest ways NOT to get sales from Craigslist is to try to sell something in your Craigslist ad. Sound counter-intuitive? Sounds nonsensical, right? It is true though! I don’t sell homes in my Craigslist ads – ever. It’s not my objective. My objective with my Craigslist ads is to generate leads, and to drive those leads to contact us. Then I can convert those leads into a buyer presentation over the phone. My job is to sell ALL the homes in the MLS — not just one. So I never make my objective in my Craigslist ads to sell one particular property. Your job when you create Craigslist ads is not to sell, but instead to create value and point people to your lead magnet website (more on this in the next section), and to get as much information from them as possible so that you can convert them to a client. So let’s say you have created the ideal Craigslist ad. It has a killer headline, and people are clicking on the ad left and right. What can kill all of this great momentum is sending people when they click on your ads to your business card website. What is a business card website you ask? Well, if you have a website that just has your picture, your phone number, your email address and your listings — and that’s it — then you have a business card website. It is any website that serves another function other than only lead generation. The only reason you want people clicking on your Craigslist ads is so you can CAPTURE THEIR INFORMATION! Capturing people’s information allows you to do your job, which is to convert them into a customer and, ultimately, a paid closing. Capturing people’s information is your number one job! So don’t ever post Craigslist ads that send people to a business card website. It is setting your ads up to fail. The last and final mistake you can make when posting Craigslist ads is to not be strategic about when and how many ads you post. Some people believe if posting one ad is good, then posting twenty ads is better. While I am a proponent of posting multiple ads, you do not want to post all of your ads at one time. This will backfire on you. Lead generation and marketing is the most important thing we do as real estate agents. So you need to spend 70% of your time on this, or you’ll fail in this business. Being strategic about your Craigslist ads and taking some time to spread out when you post your ads will go a long way toward your ads succeeding. So ideally you want to break up your ads so that they are posted at different times of the day. 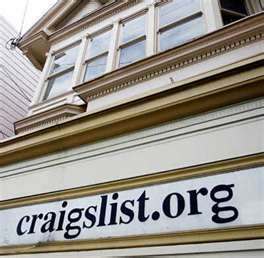 Avoid these five major Craigslist mistakes, and you will see your results from using the great, free resource of Craigslist, explode. Take advantage of this great resource, and hit it right, and you could start seeing consistent sales every month from it. 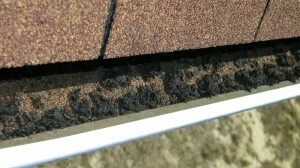 Home Inspectors look in the gutter of a home for several reason. First, to check for blockages and debris that may compromise the effectiveness of the gutters and downspouts. Secondly, to check for damage that may not be visible from the ground or exterior. Third, is for Composite Roofing Material. This can be a major clue as to the life expectancy for your roof. 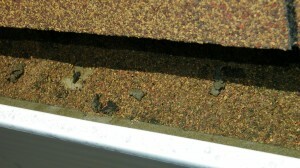 This homes gutters reveal to an experienced home inspector a serious problem. A problem that could cost a potential buyer thousands of dollars. Some material is part of normal decay, however, this is way too much for the age of this roof. The Home inspector noticed that these gutters on the back of the house were loaded with Composite Roofing Material, but the front of the house had far less. After further investigation the home inspector confirmed that the back of the house was seriously damaged by hail and needed to be replaced. The sellers insurance company paid for a new roof installation and both the buyer and seller where satisfied. This is a big part of the Home Inspectors job–follow the clues and save you money. What’s the big deal, it’s a dryer vent? Watch this Today Show Video. Improper dryer vents are a much bigger and more common safety problem. Here are a few tips to keep your clothes dryer running safely and efficiently. Use metal dryer ducts to help prevent dryer fires. Consumer Reports says that flexible dryer ducts made of foil or plastic are the most problematic because they can sag and let lint build up at low points. Ridges can also trap lint. Metal ducts, either flexible or solid, are far safer because they don’t sag, so lint is less likely to build up. In addition, if a fire does start, a metal duct is more likely to contain it. 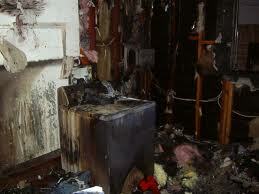 See our dryer safety report for more tips as well as photos and a dryer-venting video. No matter which kind of duct you have, you should clean it regularly. In addition, remove the visible lint from the lint screen each time you use your dryer. This not only will reduce the risk of a fire, but your clothes will dry faster and your dryer will use less energy. If dryer film is a worry, there is certainly no harm in occasionally cleaning the lint filter with warm soapy water and a small brush. Take special care drying clothes stained with volatile chemicals such as gasoline, cooking oils, cleaning agents, or finishing oils and stains. Wash the clothing more than once to minimize the amount of these chemicals on the clothing, and line dry instead of using a dryer. Avoid using liquid fabric softener on all-cotton clothing made of fleece, terry cloth, or velour. In our flammability tests, liquid fabric softener added to rinse water accelerated the burning speed of these fabrics. If you want a softener, use dryer sheets instead. Occasionally wipe the sensor with a soft cloth or cotton ball and rubbing alcohol to keep it functioning accurately. Sensors are usually located on the inside of the dryer, just below the door opening, and can be hard to find. They are usually two curved metallic strips, shaped somewhat like the letter “C”. A quality Home Inspector will inspect your home with a “Safety First” mindset. This means at Vision Home Inspection we take dryer vents very seriously. Home Inspector discovers hail damage on West side of the roof. 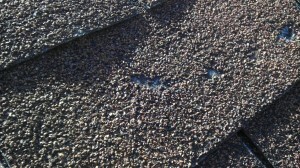 The life of this roof has been seriously compromised due to excessive hail damage. What makes this inspection interesting is the fact that there was very little damage on the East side of this A-frame roof, which is much more easily visible from the ground. The West side of this home is parked rather close to its neighbor obscuring everyone’s view from the ground. We have all seen storms where the wind causes the rain, hail or snow to come down at a severe angle. 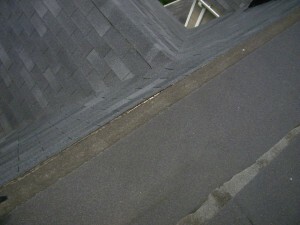 This is what can result–one side of a roof is devistated while the other may show little or no damage. Just because one side of a roof looks good, the inspector must check each individual side. During the home inspection the inspector traversed the roof and discovered this rather serious undisclosed damage. The Louisville, Kentucky Real Estate Market has held it own during the recent economic downturn. Watch this video and get the real numbers. How important is it for your Home Inspector to traverse the roof? Is that wood showing through the roof of this $340,000 home? Make sure your Home Inspector is willing to get on the roof. No Home Inspector on the planet could see this from the ground. Only by climbing up the roof of this three story home could the separation in the seam of this roll roofing be discovered. Not even the most studious home buyer would have traversed this roof. They could have spent hours looking around this home with family and friends and never noticed this potentially expensive issue. If your pilot lights are not lit, then important items such as the water heater, gas stove or furnace will not be inspected and the buyer could delay closing until those inspections are completed. The home inspection will require getting into your basement and / or attic as well, so keep a path cleared. Move boxes away from the walls.